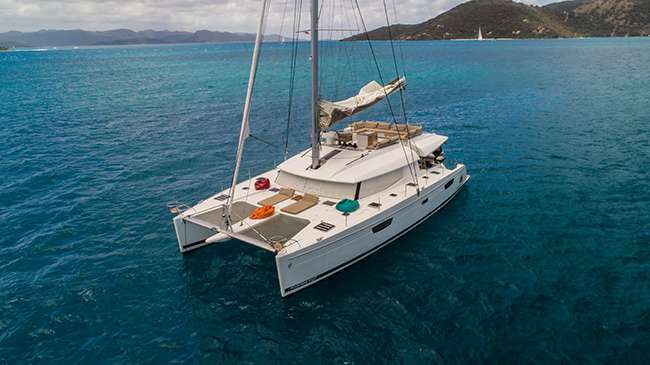 The charter catamaran Dreamsong, a 60-foot Fontaine Pajot that accommodates up to 10 guests, will no longer offer diving from the yacht (rendezvous dives only). Don't worry, any charters previously booked with diving will be honored. A 10-pax catamaran is ideal for Spring Break and Dreamsong has a 6-night opening that may fit your needs; Sunday May 17th through Saturday May 23, 2018. 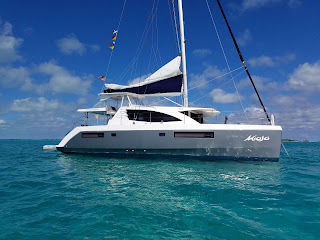 Dreamsong is a 60-foot Fontaine-Pajot catamaran with a crew of two, Luke and Erin Fumas. Captain Luke has an abundance of local knowledge as he is a St Thomas native and has been navigating the waters of the Virgin Islands since he was born. Erin has been in the islands for several years and is an excellent chef. Her ability in the galley results in creative delicious meals tailored to her guests preferences. Dreamsong accommodates up to 10 guests in 5 Queen cabins each with ensuite heads having an electric-flush toilet and stall shower. They have a very spacious salon, large aft deck for lounging and alfresco dining, plus a flybridge offering a 360-degree view of paradise. Dreamsong has a 14-foot dinghy with 90HP motor, waterskis for kids and adults, kneeboard, wake board, tube, 2 standup paddleboards (SUPs), snorkel gear, floating mats, noodles, TV/DVD in salon, iPod dock, onboard wifi where available, fishing equipment (catch & release). Please note that Dreamsong is a non-smoking yacht. $4000 off 7-night charters in the Grenadines between August 15 and October 31, 2018. No discount on less then 7 nights. However, yacht will waive the surcharge on short term charters. This summer Bagheera will be chartering in the Grenadines and offering 10% off any 7 night charter between June 15th to August 24th 2018. Pick up/drop off Grenada and/or St. Vincent please. 15% off for any 7-night charter booked and taking place in July or August 2018. Depending on dates, charters may take place either in the VI or St. Maarten area. 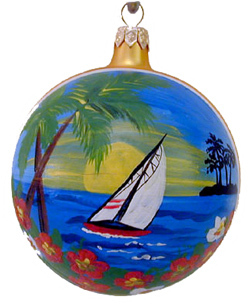 10% OFF in the Grenadines and Windward Islands! Book by October 20, 2018 and sail by October 24, 2018. Special rate of $34,000 for up to 8 guests (discounted from $40,500) on the first 10 charters (SIX LEFT) booked. 10-guest special = $40,000. Charters can be taken at any time except over Xmas/New Year. Rate valid for 7-day charters only. $2,500 discount off standard rate on new bookings for 7-night charters that take place from now until August 12, 2018. 15% off any full-board inclusive charter to take place between October 10-20, 2018 in the GRENADINES. Free sleep aboard included. $1,000 off any Grenadines charter for July and August 2018. 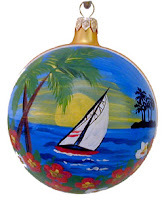 Available from Union Island south to Grenada. $2000 off any 7-night, all-inclusive charter taken from now until October 31, 2018. May be pro-rated with a 4-night minimum. $1200 discount off 7-night charters (up to 6 people) booked before December 14, 2018. 5 night minimum. May be combined with other special offers. Check out these special offers, along with others (kid discounts, sleep aboards, special events such as Honeymoon charters) on our Special Offers web page at Click to View. This morning we updated our list of yachts that are still available for a 2018 all-inclusive, crewed Christmas and/or New Years charter in the Virgin Islands. We also added 3 or 4 monohulls to the mix. There have been quite a few holiday bookings in the last 2 weeks but we still have a good selection of yachts to choose from. Here is a yummy photo of lunch aboard the catamaran Stop Work Order. Lunch is served! 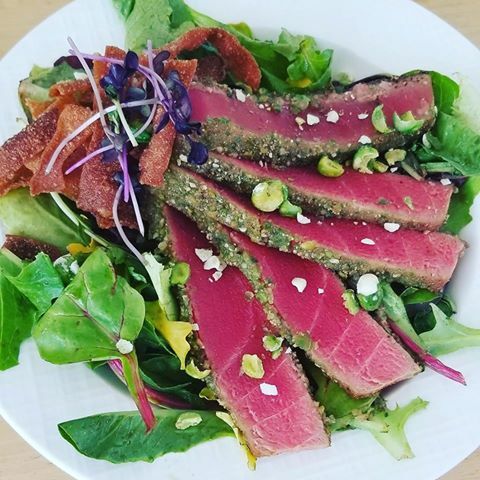 Wasabi pea crusted Ahi with a Ponzu dressed salad and crispy wontons! 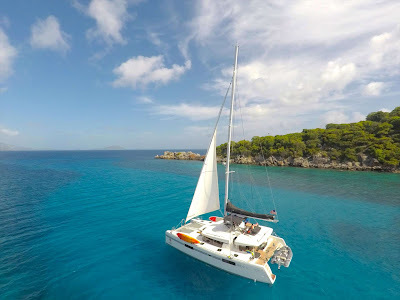 We have updated our list of catamarans who are available for a Christmas charter in the Virgin Islands. We had to remove quite a few booked yachts or change their dates because some now have New Year bookings and we also added 3 or 4 boats to the mix. We are happy to say that there are still a good selection of yachts to choose from, ranging from a 2-person charter to a party of 10. Charter Catamaran MOJO has relocated to the Virgin Islands for yacht charters and has completed their BVI inspections, They are all legal and ready to go! Mojo will be chartering through July 31st in the Virgin Islands, take their summer break, and be back for the new season in November. 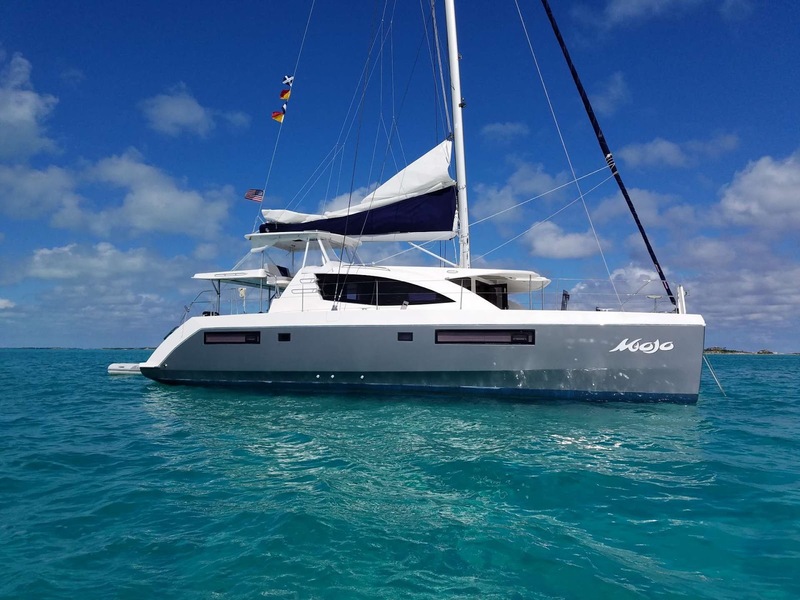 Mojo is a 48-foot Leopard catamaran with a crew of two, Matthew & Jennica. Mojo is fully air conditioned and accommodates up to 6 guests in 3 Queen cabins, each with private, ensuite head comprising electric-flush toilet, sink, stall shower. Mojo has ample outside lounging space with their large aft cockpit, forward deck lounging area, and flybridge seating. Mojo has a 12-foot dinghy with 30HP motor, tube, 2 standup paddleboards (SUPs), snorkel gear, 6 floating cushions, giant blow-up water toys, large floating island, iPod dock, 4 hammocks, etc.